This blog breaks down all four double header of games played in the Midwest Region, which are the games that appear in the upper right corner of brackets. It shows the top 10 players on the floor for each of these double headers, and gives details on which factors give advantages to which teams. This bracket looks wide open however. 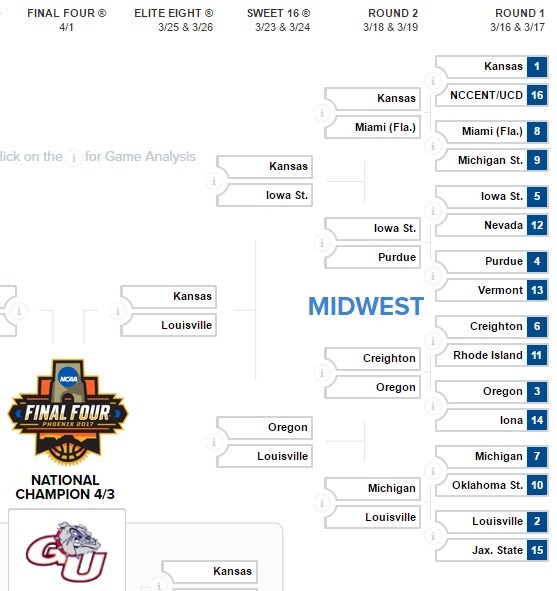 Kansas is the overall winner despite Louisville and Iowa State splitting the nine categories evenly, and based on the "Top 3 Players" equation Iowa State goes all the way to the championship game. Click here for the grid showing the results of the entire tournament using 10 different approaches. If you simply want to fill out a bracket quickly, you can go straight to that link and fill out your bracket in about two minutes choosing any of the 10 options. That post also explains the 10 different approaches. Many more stories appear here, and you can sort the rating for all 4000+ players and see who is injured by clicking on www.valueaddbasketball.com. 176, Nick Ward #44, Michigan St.
191, Miles Bridges #22, Michigan St.
Possible “style/home” edge upset: Kansas will have the big home advantage. 7, Monte Morris #11, Iowa St.
55, Nazareth Mitrou-Long #15, Iowa St.
174, Matt Thomas #21, Iowa St.
238, Deonte Burton #30, Iowa St.
Possible “style/home” edge upset: None. “Home” advantage: Two higher seed home edge, but Iowa State more so in second game including Deonte Burton coming back to the arena where he played for Marquette before transferring. When one of the greatest coaching family’s of all time (Dan Hurley) is coaching Allen Iverson’s cousin, it is no surprise Rhode Island has improved from 50th to 37th. Greg McDermitt steadied the ship with a run to the Big East Finals after the team had fallen from 16th to 27th after Watson’s injury. He hopes to have a chance to take on Creighton’s former coach in Dana Altman of Oregon. Healthy: Oregon and Creighton were hit with two of the biggest injuries in the country, however Oregon’s bench is good enough to offset most of the loss of Chris Boucher, while Creighton was one of the most hurt teams in the country after point guard Mo Watson went down for the season. Possible “style/home” edge upset: Rhode Island is very good at denying 3-pointers (18th in country) that Creighton needs (13th best 3-point shooting). 21, Jawun Evans #1, Oklahoma St.
30, Jeffrey Carroll #30, Oklahoma St.
141, Phil Forte #13, Oklahoma St.
255, Erik Durham #15, Jacksonville St.
Michigan improved from 40th to 21st in the last month, winning the Big Ten title along the way after surviving a plane crash to enter the tournament as the hottest team in the country behind only SMU. Possible “style/home” edge upset: Michigan doesn’t turn the ball over (9th best at protecting the ball) and forces opponents to take 2-pointers (9th best), which seems to stop the two chances Oklahoma State would have at the upset (29th in steals, and 9th in three-point shooting).